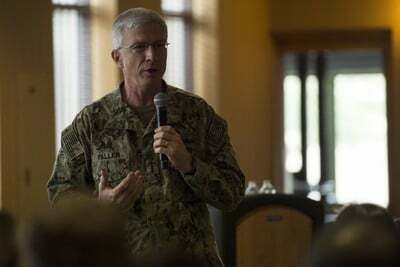 DAVIS-MONTHAN AIR FORCE BASE, Ariz. — The Commander of U.S. Southern Command, U.S. Navy Admiral Craig Faller, visited 12th Air Force (Air Forces Southern) Jan 8-9, 2019. Faller recently took command of the U.S. Southern Command, which is responsible for all Department of Defense security cooperation in the 45 nations and territories of Central and South America and the Caribbean Sea. The visit was meant to integrate and familiarize him with 12th Air Force (Air Forces Southern), the air and space component to USSOUTHCOM. Twelfth Air Force (Air Forces Southern) Airmen gathered to hear Faller speak at Club Ironwood, Davis-Monthan Air Force Base. Faller stressed the importance of every Airmen’s contribution to the success of the USSOUTHCOM and to U.S. national interests. During the 12th Air Force (Air Forces Southern) mission briefing, Faller met with partner nation Air Force liaison officers from Argentina, Brazil, Colombia, Chile and Peru. Throughout the integration, Faller expressed to 12th AF (AFSOUTH) leaders and Airmen that partner nation relationships in the Caribbean, Central and South America are important and vital to accomplishing the mission.